Sygg, River Cutthroat is a two-CMC commander with built-in card draw! And he's fairly cheap. So this is a budget deck built around trying to maximize Sygg's value. Whenever an opponent loses 3 or more life in a turn, Sygg lets you draw a card. The best way to reliably do that in Dimir, I discovered, is with effects that punish your opponents for discarding and for having no cards in hand, such as Breathstealer's Crypt . I think I pulled off an effective, budget-friendly build. 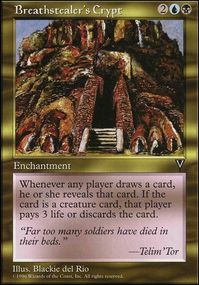 The problem is that next to having their lands destroyed, people probably hate having to discard their cards more than almost anything else in Magic. So this is a deck for budget players who either have a playgroup where that sort of thing is fair game, or for budget players who want a deck to pull out for, well, sweet, sweet vengeance. So if you fit that description, this deck is for you! Otherwise, probably best to find a deck that is a bit friendlier.